Faustina Kowalska was born on 25 August 1905 and was christened Helena. She was the third of ten children born to Marianna and Stanisław Kowalski, farmers from the village of Głogowiec in the parish of Świnice Warckie, Poland. Faustina had less than three years’ schooling. At the age of 16 she went into service with wealthy families in Aleksandrów Łódzki and in Lódź, to earn a livelihood for herself and to help her parents. Following her vision of the suffering Jesus and then one year of service in Ostrówek, Klembów, 20 miles north-east of Warsaw, 1 August 1925 saw her entering the Congregation of the Sisters of Our Lady of Mercy, where during the ceremony of taking the veil she was given the name Sister Mary Faustina. During the thirteen years of her religious life she lived in many houses of the Congregation, but spent her longest periods in Kraków, Vilnius, Płock and Warsaw, serving chiefly as cook, gardener or portress. She suffered from tuberculosis of the lungs and of the digestive tract. For this reason, Faustina had two lengthy periods of treatment in Prądnik Hospital in Kraków. Her seemingly very ordinary life hid an amazing depth of union with God and the great prophetic mission which God entrusted to her. Faustina experienced many extraordinary graces, reaching the heights of union with God on earth. Through her, Jesus reminded the world of the biblical truth about the merciful love of God for every man and called her to proclaim it to the world with new power. To do this, Jesus handed over the new forms of the devotion to The Divine Mercy, which are: the image with the inscription: “Jesus, I Trust in You”, the Feast of The Divine Mercy on the first Sunday after Easter, the Chaplet of The Divine Mercy and the prayer at the moment of His agony on the cross, referred to as the Hour of Mercy. Jesus attached great promises to each of these, and also to spreading the veneration of Mercy, always providing that great care is taken to maintain an attitude of unfailing trust in God (doing His Will) and acting mercifully towards one’s neighbour. Blessed Fr. Michael Sopoćko, her spiritual director, and Fr. Józef Andrasz SJ, her Kraków confessor, helped Sister Faustina fulfil this prophetic mission. From the charism and mystical experience of Sister Faustina, The Divine Mercy Apostolic Movement was born in the Church, the movement which undertakes her mission of proclaiming the mystery of God’s mercy to the world through life witness, in deed, word and prayer. 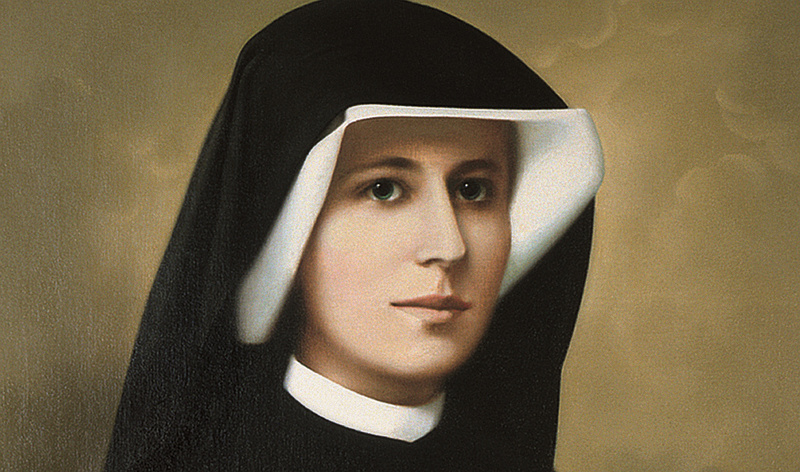 Sister Faustina died on 5 October 1938 in the convent of the Congregation in Kraków-Łagiewniki. In 1966, her mortal remains were moved from the convent cemetery to the convent chapel. Since her Beatification, which the Holy Father John Paul II announced on 18 April 1993, the coffin with her relics has rested on the altar under the miraculous image of The Merciful Jesus in the Shrine in Kraków-Łagiewniki. On 30 April 2000 the Holy Father John Paul II numbered her among the saints. John Paul II transmitted the message of Mercy, which at the command of Jesus the saint had written in her “Diary”, to the whole Church and to the world for the third millennium of faith. On 25 August 1995, the Congregation of the Sisters of Our Lady of Mercy, continuing her charismatic mission, acknowledged Sister Faustina as its spiritual co-founder. sr. M. Elisabeth Siepak C.O.L.M.